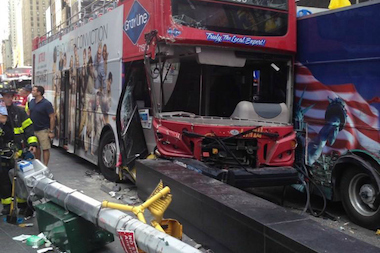 MANHATTAN — The driver who careened his double-decker tour bus onto a Times Square sidewalk injuring 14 people Tuesday was on drugs at the time, the NYPD said. William Dalambert, 58, was driving a Gray Line bus south on Seventh Avenue when it hit a blue City Sights tour bus, jumped the curb near 47th Street and knocked a street light onto pedestrians standing nearby, police said. Fourteen people were injured, including a tour guide who was the only person aboard the Gray Line bus aside from the driver. They were taken to St. Luke's and other area hospitals, officials said. Three people's bones were broken in the crash and they were in serious condition, officials said. Police later discovered Dalambert, who lives in Irvington, New Jersey, had drugs in his system and arrested him at 8:30 p.m. for driving while his ability was impaired, an NYPD spokeswoman said. It was not immediately clear what type of drug or how much of it he had taken. A spokesman said the bus company was conducting its own investigation. “Twin America is committed to the highest standards of safety and customer service and in addition to cooperating with local authorities, we are simultaneously conducting a thorough internal review of our safety rules and driver protocols,” David Chien said in an email. Dalambert was awaiting arraignment Wednesday, prosecutors said. Witnesses were horrified by the crash, including 50-year-old tourist Greg Mooney who had jumped out of the way as the traffic pole came crashing down at about 3:20 p.m. on Tuesday. "The bus hit [a woman] and then knocked down the pole," he said. "And then the pole hit another woman sitting a way down the road. "Three or four others got scrapes and scratches from shrapnel," Mooney said.